Home > Communication > News > What the students do once they finish their training at SIGMA? What the students do once they finish their training at SIGMA? On the graduation ceremony for the last promotion of the Learning Center for the year 2016- 2017 and with the presence of students, tutors and members of Fundació BCN FP, the results of the last study carried out over the last few months by the Learning Center were presented. The conclusions of the study about what the students do once they finish their training with us were well received by everybody present at the ceremony and confirm that the project is heading in the right direction. 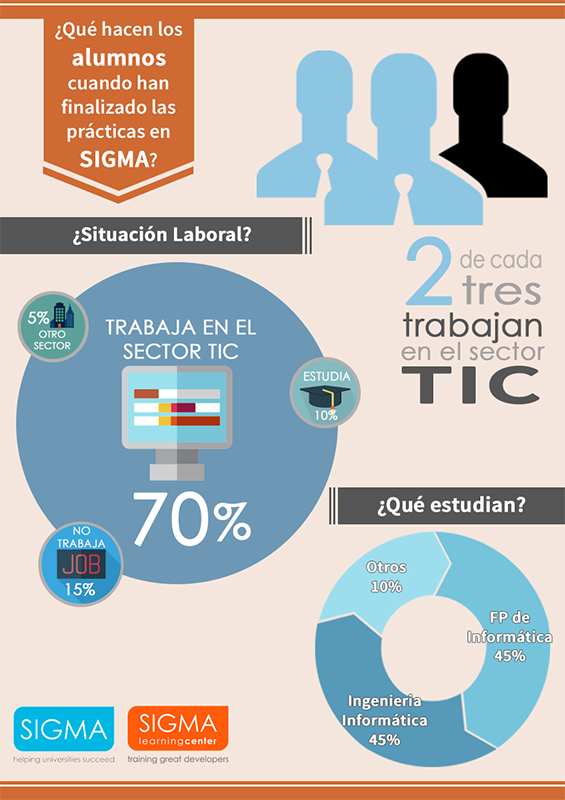 If we take a look at the results, we can clearly see that nowadays two out of three students are currently working on the TIC field (70%) while the 10% of them have decided to continue their studies. On the other hand, the 15% of the students are neither working nor studying. Besides, taking a deeper look at the 10% of the students that have decided to continue with the studies, we can see that right now, the number of students taking the computer engineering degree is even with the number of students taking de Computer Certificate of Higher Education. Years ago, the tendency was completely the opposite so it is fair to say that nowadays the CFGS (Certificate of Higher Education (HNC)) are a great option to continue the student’s formation.